Editor’s Note: Due to the hurricane and other unforeseen disruptions, this quarter’s edition of FUELSNews 360° has been delayed. We apologize for the inconvenience. The third quarter of 2017 was a tumultuous one for markets, characterized by an uptick in both geopolitical activity and weather events. Prices trended higher as OPEC cuts tilted markets towards supply tightness and declining inventories, especially in the U.S.
On the supply side, the OPEC/Non-OPEC deal continued to drive markets higher, though the deal, at times, struggled to contain Libyan and Nigerian production. American production continued to dazzle markets with its growth, despite a temporary slowdown during Hurricane Harvey. Around the world, political struggles rose to the top of the headlines impacting crude oil prices. East Asia, South America, and the Middle East all experienced their share of instability, and a new and un-tested U.S. president created added layers of risk for markets. Those trends will continue to play out over the coming 3-6 months, and represent one of the largest risks for fuel price. Despite international uncertainty and rumors of conflict, oil demand was strong throughout Q3 in the U.S. and worldwide, driven by strong economic growth. In the U.S., economic factors are the strongest they’ve been in years, leading many to expect an interest rate increase before the end of the year. Looking to the future, economic strength should continue to propel oil demand higher. At the fuel products level, no factor in Q3 was more disruptive than Hurricanes Harvey and Irma, which devastated refineries along the East Coast and caused both domestic and international fuel disruptions. Along with limited fuel supplies, fuel transportation was hampered, including the slowdown of the Colonial Pipeline and freight shortages throughout the Southeast. More details on the impacts of the storms are included on page 26. At the regional level, refineries throughout the country opted to put off repair work, staying open to capitalize on higher prices during the post-Harvey recovery. Repairs cannot be put off forever, though, so expect to see above-average refinery maintenance activity in Q4 and into 2018, which could impact regional fuel prices. In the Northeast, the battle continues raging between Chicago-area refineries pushing fuel eastward and refineries along the East Coast. Crude economics make fuel from Chicago cheaper, putting East Coast refining operations at risk. Chris Carter gives the latest update on the on-going struggle on page 16. Looking to Q4 2017 and early-2018, expect prices to remain elevated, with crude oil in the $40s unlikely to return soon. Supply tightness will likely continue at least through March 2018 when the OPEC/Non-OPEC cuts expire; beyond then, only time will tell. Although U.S. crude will continue to keep a lid on WTI crude prices, the floor has also been set, keeping prices in the $50-$60 range for the next quarter. This quarter, Tom Krizmanich continues his three-part series on natural gas procurement. This quarter’s article details the key considerations to make when choosing a natural gas supplier, as well as what service offerings to consider when buying gas. Make sure to read FUELSNews 360° next quarter to read about the synergies between fuel and gas buying, and how both types of buyers can learn from each other. 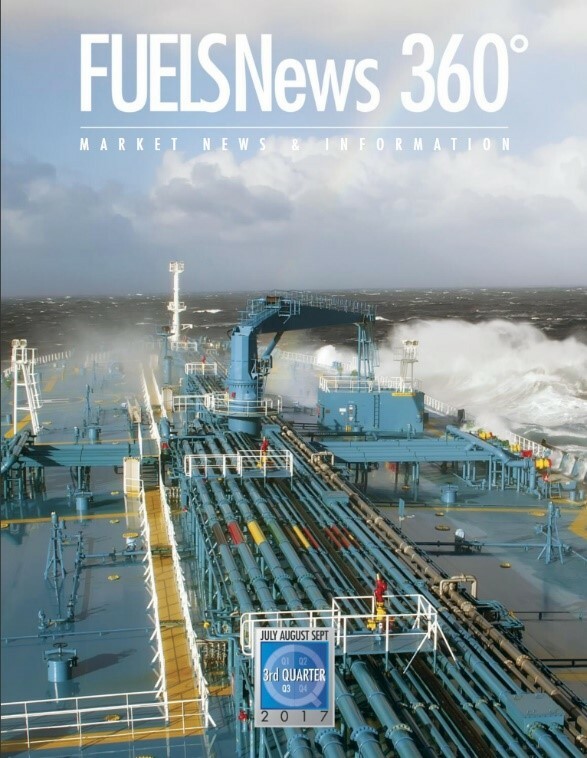 We hope you enjoy this quarter’s issue of FUELSNews 360°. Please feel free to email us at fuelsnews@mansfieldoil.com with feedback, questions, or simply to request additional copies. Click here to read the Full Edition of FN360.